The Moleskine sketchbook is a place where appointments, projects, relations, reminders and memories, words, ideas, dreams, projects and stories are collected. Like in The HUB, a worldwide platform where persons exchange and develop ideas. This blog tells you about these stories. As you can expect from ZUP, we will do that with the help of a recipe that – after mixing the ingredients together and do some cooking – becomes a soup: ZUP – ZUP the recipe for change activates the sharing and creation of new recipes of social and cultural innovation. On a Monday evening 70 hubbers full of ideas and expectations started the workshop: in one hour they were asked to follow three steps to explain their own projects, ideas and wishes and translate these in recipes. For the occasion we collaborated with Moleskine that offered each participant a notebook that functioned as a platform to write down stories, appointments and creative inputs. 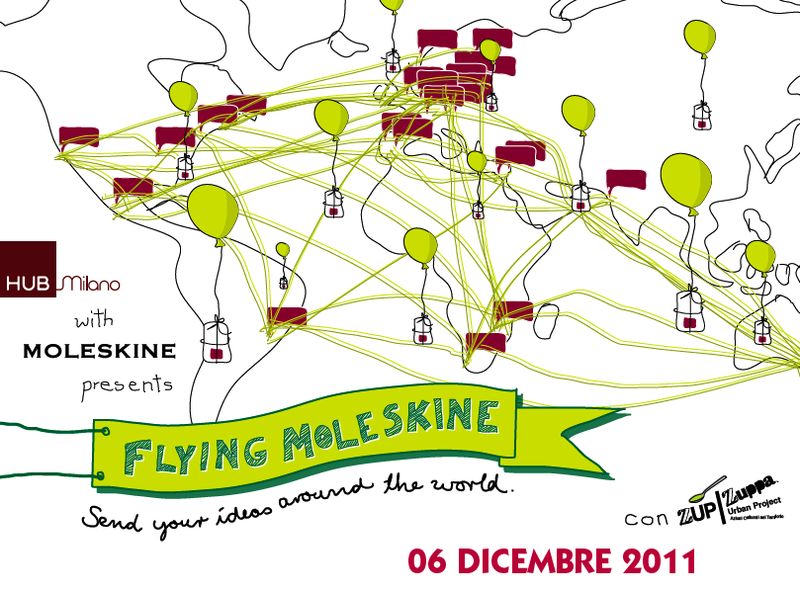 ZUP was hosted by The HUB Milano with whom we have curated the workshop which at the same time was the launch of the Fly Your Moleskine Project. The diversity of the projects, the will to share and explain, the willingness to play and to elaborate in a creative way helped the participants to put their ideas on the table. Or better: on the dinner table, as ZUP uses food as an instrument to get the participants going. If we want to assign tags or keywords to summarize the evening we define the words networking, sharing, opening-up, innovation, projecting and enthusiasm. And that is what characterizes a HUB and why we choose to propose a ZUPlab to them. The result of just an hour of work are eight recipes with confusing names but with clear explanations: Freedom and Sangria, Subvert the relation (the sauce that was missing! ), Hotchpotch Melting Pot, Happy Day, Risotto the Amaca Way, Spicy Chicory Spring Rolls, Velvet of Celery and Straws, HubblyBubbly – the aphrodisiac for creativity. Down here you’ll find some impressions of the evening, while an overview of the atmosphere of the evening is on display on our facebook page.